Dubai will be a key stop in swimming ace Chad le Clos’ training regimen as the Olympic and world champion from South Africa targets glory at the 2020 Tokyo Games. “I have done some good work this year. One tends to carry forward one’s mileage from the year before, and we will see the results at the World Championships [in Hangzhou, China from December 11-16],” Le Clos told Gulf News on Saturday. “Hangzhou will be a sort of starting point for me heading towards Tokyo. I want to win in Tokyo and that’s the most important thing for me over the next couple of years. It’s important for me to achieve my most immediate goals at the World Championships in China,” he added. One of the biggest stars in his sport, Le Clos has a total of 51 medals from major international competitions, including 31 gold, eleven silver and nine bronze. However, his defining moment as a top-class athlete came on the fourth day of the 2012 London Olympics when Le Clos beat his hero, two-time defending Olympic champion and world record holder Michael Phelps by 0.05 seconds to win the 200m butterfly in 1 min 52.96 sec. He consolidated this form winning four gold and a silver across three World Championships starting in Barcelona (2013), onto Kazan in 2015 and Budapest in 2017. But in-between came the disappointment in Rio de Janeiro where Le Clos failed to defend his 200m butterfly crown while finishing fourth. However, now a good 12 weeks into his training schedule headed towards the next Olympics, Le Clos is clear of his goal as he targets Tokyo 2020. The South African, who alternates with his training between Turkey [at Ukrainian businessman Konstantin Grigorishin-funded ‘Energy Standard’] and Italy, wants to use Dubai as a final step before heading to Hangzhou. The 26-year-old resident of Durban was in Dubai over the weekend as a host of the inaugural open-water mass participation swimming event — Daman DXB SwimFest, presented by Jumeirah Beach Hotel and Wild Wadi in partnership with Professional Sports Group, on Saturday. One of the most telling images of the swimmer during the 2012 London Olympics was Chad’s tearful father Bert narrating the success story of his son after the swimmer had defeated Michael Phelps for the 200m butterfly gold. His mother Geraldine had been diagonised with cancer in 2010 and subsequently in 2016, Bert too underwent surgery. “My family has been my rock and shield all through. I have got amazing support from all of them, and through the sickness we have come even closer,” he said. Le Clos plans to spend at least 10 days in training at the Hamdan Sports Complex in early December prior to his departure for China. 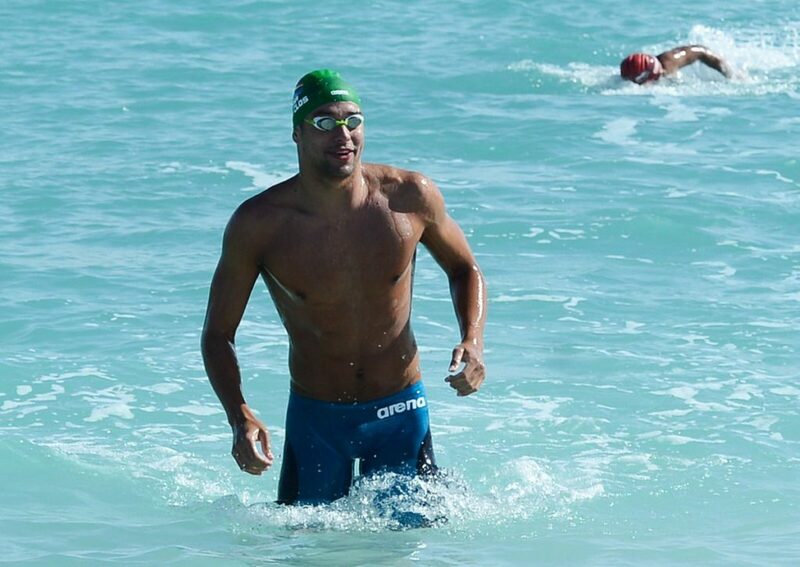 “Today, I swim for my family, for my country and all my fans in South Africa and in Dubai too. I love Dubai and feel so much at home here,” he added with a smile.